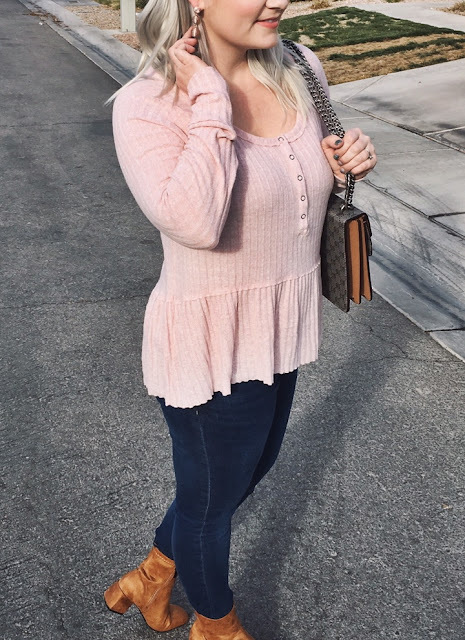 Today I'm sharing an outfit featuring my latest go-to booties. 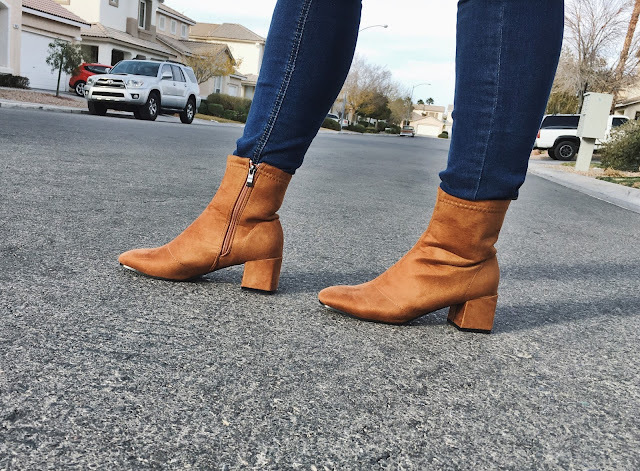 These faux suede ankle booties are a bright caramel color, which I really like because they go with so many things in my closet right now. They come in gray and black too. The slightly square toe and two-inch heel make them super comfortable (which is a must for me running around with an infant lately). The shaft of the boot is fitted, with enough room to fit a pair of skinny jeans tucked in. I plan on wearing these with plenty of moto leggings and tights, too. Overall, I think these boots fit true to size. I normally wear a 7.5 in boots and ordered a 38 which fit perfectly. If you like to wear super thick winter socks with boots, I'd recommend going up a full size. This post was created in collaboration with Gamiss. All thoughts and opinions are my own. Those boots are THE PERFECT color. It's hard to find the right carmel-ish shade of camel! Love them! I love boots like these. I have to be careful about the height on me though because sometimes if they hit weird, I get cankles lol. Thanks. I love the heel height. Gorgeous look I love your style! There are several online shoe catalogs, which can assist you. From top brands to popular footwear, the catalogs specialize in baby boy's shoes. They also features special sales, shoes voucher codes, promotions, and discounted rates. You can effectively compare prices, brands, and accessories before purchasing them. There are various online sites from where you can settle for the best of deals. Fabulous shoes for less are what you get out of these shoe clearance sale. These sale give you the opportunity to hunt for the best Shoe Embassy Discount online and get free shopping and great discounts for an attractive pair of footwear.